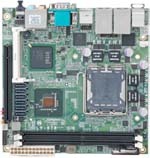 à base de processeurs VIA C7, AMD geode, pentium M ou pentium Core DUO mobiles. 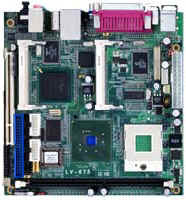 Mini-ITX AMD Mobile Turion 64 X2 / Sempron Motherboard. 8 V ~ 21 V Full range DC input or standard 24-pin ATX power supply . 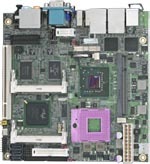 Intel® Pentium M / Celeron M , 400/533 MHz FSB . 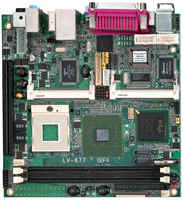 Intel® 945G & ICH7R .2 x DDR2 533/667MHz SDRAM up to 2GB. 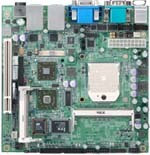 Intel® GMA950 technology . 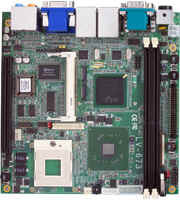 4 x SATA II with 300MB/s transfer rate. Realtek 7.1-CH High Definition Audio. Onboard GPIO port. 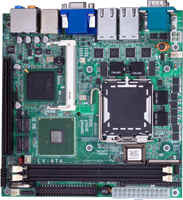 1 x Mini-PCI socket and 1 x PCI-Express slot. 4 x Giga LAN , 2 x IEEE 1394 , 4 x USB 2.0 , S/PDIF. 2 x RS232 , GPIO , IrDA. 2 x DDR2 400/533 MHz SDRAM up to 2GB. Intel® High Definition Audio compliance. 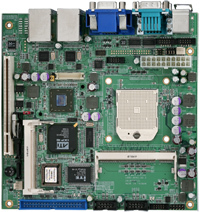 1 x Mini-PCI socket and 1 x PCI-Express X16 slot. CompactFlash and PCMCIA socket on solder side. 2 x Giga LAN , 2 x SATA , 6 x USB 2.0 , S/PDIF. 4 x RS232 , GPIO , IrDA.